Louise Davis Miller, better known as Weezie to her family and many friends, died peacefully on Monday, January 15, 2018 at Glenaire Retirement Community in Cary after a gradual decline in health. Miss Miller was born in Greensboro, NC on October 31, 1921, the daughter of the late Frank T. Miller and Louise Davis Miller. Throughout her life she enjoyed celebrating the fact that she was born on Halloween as continually evidenced by the sign "The Witch is In" adorning her door at Glenaire, her home since 1992. 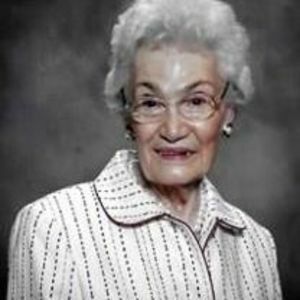 Louise attended Greensboro schools and graduated from Salem College in 1942, followed by special graduate work in early childhood education at Woman's College in Greensboro. She began her teaching career during World War II in 1943 in Child Care Centers at Aycock and Central Jr. High Schools in Greensboro. In 1945 she began teaching in the pre-school program at First Presbyterian Church and helped to establish the kindergarten program there where she served as a Lead Teacher for the next 47 years. Beloved by all, she touched the lives of hundreds of children and their families through her creative talents with her weather puppets, her story telling, special Christmas ornaments and her love of children. It was a great source of joy to Louise that several of her students followed in her footsteps as teachers at First Presbyterian. Louise was active in childhood education groups in Greensboro and participated in many volunteer activities at First Presbyterian and through the Junior League of Greensboro. Her "not so secret desire" was to be discovered and hit Broadway as a star, so it is not surprising that she participated in all the Greensboro Junior League Follies and then helped to organize and star in every talent show at Glenaire once she moved there. Louise loved to perform and managed to do that even while taking her long walks through the halls at Glenaire. She even entertained her family and the staff at Glenaire by dancing the Watusi around the lunch table on her 95th birthday in her famous witch's hat. Her joyful spirit was and will continue to be an inspiration to her family all of whom she adored and who adored her. In addition to her parents, Louise was predeceased by her brother F. Thomas Miller, Jr. and sister in law, Martha Jean Miller. She is survived by her three nieces and their families; Jean Sullivan of Charlotte, Anne and Ernie Simons of Raleigh, Peggy and Kenneth Sykes of Raleigh and their children; Anne Sullivan, Jack and Melissa Sullivan, Ashley and David Wood, James and Reston Mattox, Maggie Simons, Sarah and Coleman Team, Brooks and Lee Sutton, Macon and Robert Parsley and a third generation of their eleven children. An inurnment service to celebrate the life of Weezie will be held in Greensboro at First Presbyterian Church in the Garden Columbarium on Monday, January 22, 2018 at 11:00 am with Reverend Clyde Cook officiating. The family would like to thank all of those who cared so lovingly for Weezie at Glenaire and added so much to her life. Memorials may be made to Glenaire Foundation, 4000 Glenaire Circle, Cary, NC 27511 or First Presbyterian Church, 617 N. Elm Street, Greensboro, NC, 27401. Arrangements are in the care of Brown-Wynne Funeral Home, 300 Saint Mary's St., Raleigh.